The Passive Integrated Transponder ( or PIT tag ), is a very small (12 mm by 2.1mm) glass tube containing an antenna and an integrated circuit chip. The tag is inserted into the juvenile fish's body cavity. 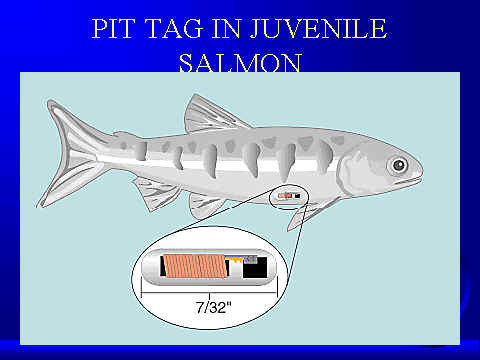 The tag remains inactive inside the fish for its lifetime, until activated at a PIT-tag monitoring facility located at a dam. As the tag is read, data about that particular fish is fed into computers, for use in research studies. The migration of the PIT-tagged fish can be tracked through the river system as it passes through smolt monitoring facilities at various dams. Each PIT tag carries a unique code to enable identification of individual fish, so smaller sample sizes are needed to obtain good results. Also, juvenile fish can be detected as they move through the monitoring facility at a dam, and can be directed to the river or to a transport barge as needed for a particular study. One limitation is that, to read the PIT tags, the fish must pass within 18 centimeters— about seven inches—of the monitor.